CHRISTMAS cheer positively poured out of Kingfield this year. 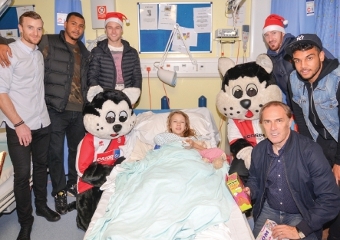 Kicking off the club’s busy festive period out and about in the community, management were joined by a small army of players to deliver presents to poorly children. 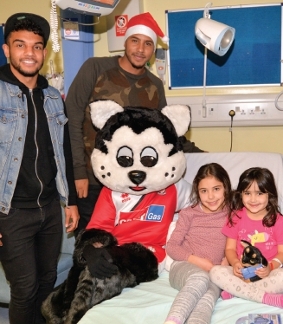 Skipper Mark Ricketts, Theo Lewis, Keiran Murtagh, James Clarke and Jake Cole joined KC Kat and Kitten in the children’s wards of the Royal Surrey and St Peter’s Hospitals, spreading joy and handing out treats. 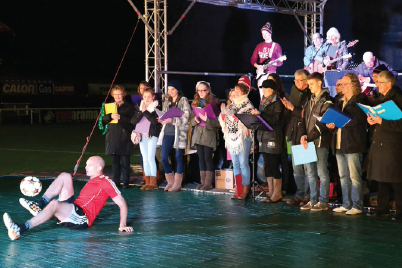 Then, on December 17, an estimated crowd of 1,000 piled into Kingfield for the club’s Silent Night fundraiser. Special guests included the Mayor and Mayoress of Woking, Tony and Mary Branagan; Chief Executive of Woking Borough Council, Ray Morgan; Cards boss Garry Hill; and a number of church leaders, councillors and Woking players. Guest contributors included former Portsmouth defender Linvoy Primus, and freestyle football world record holder Daniel Cutting, who amazed with his keepy-uppy skills. 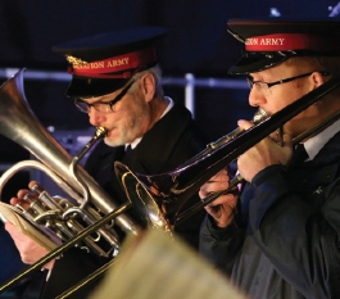 The multifaceted evening catered for all the family with poignant acts of remembrance, familiar carols and readings, historic displays courtesy of The Trench Experience, interviews, choirs from schools and the community, and music from the Unity Band, drawn from different churches. The evening was fully sponsored by local churches, which means the £1,690 raised can go directly to local charities Engage and Woking Hospice.